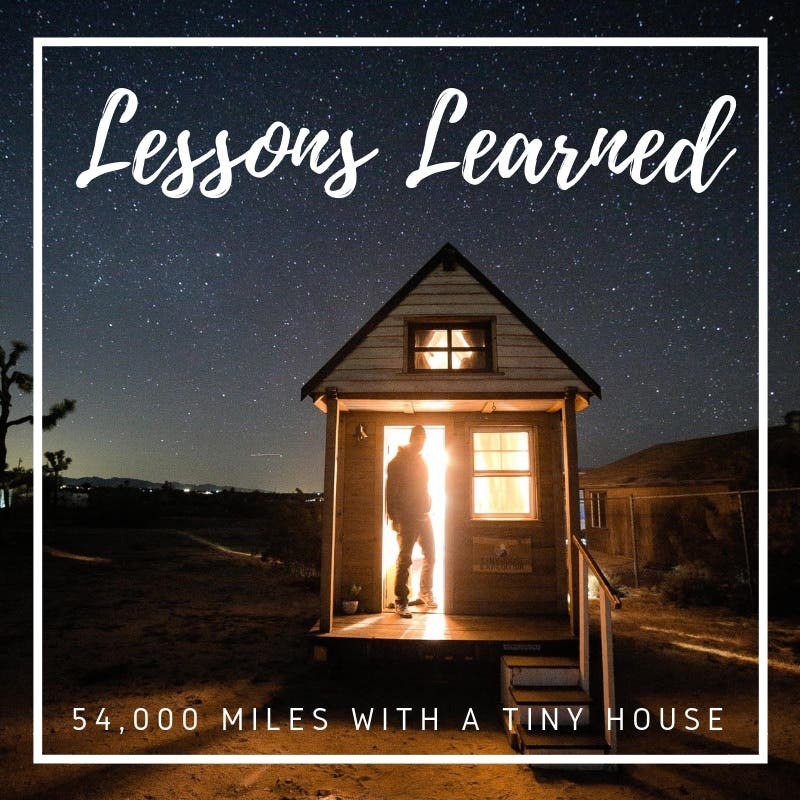 When I sat down to write this article, I started to make a list of all the lessons that I have learned over the past three and half years of tiny house travel. My first draft included over 50 examples of personal growth, travel realities, and tiny house movement insights. I just can’t stop thinking up things my partner, Christian, and I have learned after making 37 states our temporary home. What an excellent problem to have! Seven years ago, I could have never imagined that my life would be so rich in experiences. Back then I felt trapped. Turns out, the only way to change your life is to go out and do something about it. And that’s just what I did, and what we did together, with lots of support from friends and strangers, aka future friends. 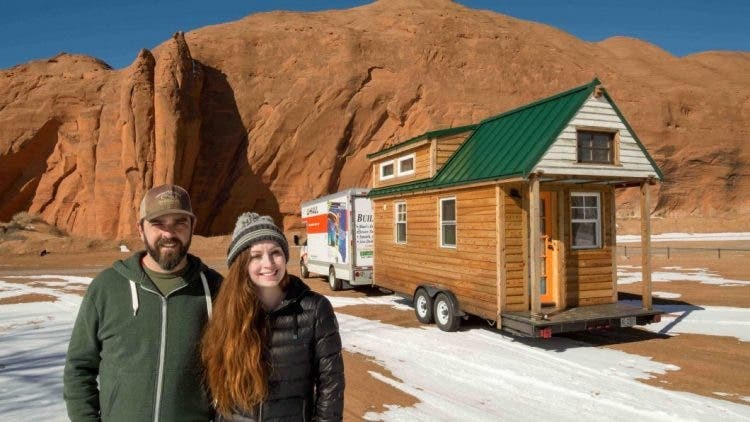 We exited mainstream America, as soon as we moved into our tiny house. And by the time we hit the road, any semblance of a traditional way of life was long gone. No office job, no physical address, no assurance that all our savings, possessions and home would not go up in flames in a car crash. I remember the first time our tiny house left the driveway where we were building (at Perch & Nest in Winston-Salem, NC). My heart was in my throat. My stomach was in knots. After my nauseating feelings subsided, all that was left was exhilaration. “We did it!” “We are really going to do this!” The more your travel with your tiny home, the easier it gets. We have found that fear and travel don’t mix. Being afraid of the unknown does no good. It can prevent you from experiencing new places and new people. Bravery is a must. That doesn’t mean there aren’t things to be wary of, or that you shouldn’t be prepared for. Our advice: keep your feet on the ground, your eyes open and enjoy the journey. 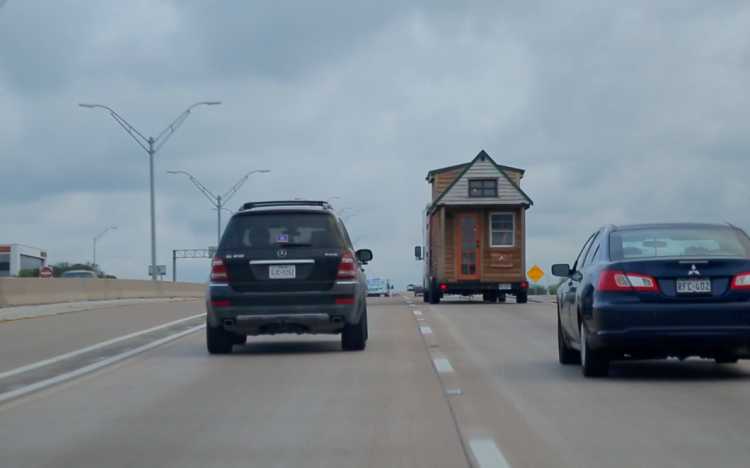 Tiny house travel ain’t cheap. We all know that living tiny can be an effective way to save money. It’s true that we have no mortgage and very few bills, and my days of impulse shopping are behind me. All said and done, we could be living quite affordably. If we stay put. Taking a 10,000 lbs. house down the road, behind a U-Haul truck, is not cheap. Gas, hands-down, is our biggest expense. Our average mpg hovers around 5-6, which equates to about $1 per mile. Has it been worth it? You betcha. Fun fact: U-Haul is our documentary truck sponsor. They lend us trucks and do all the maintenance (both of those would cost us $$$). We are responsible for gas. With a heavy duty pick-up, we could get 10-12 mpg. Still not cheap. We most frequently park in backyards and driveways found through networking or offers from strangers (again: future friends). Often these spots are free or low cost. Sometimes we strike a work/trade agreement. Occasionally we park at RV parks and campgrounds, which add up quickly. Rates range from $20-75 per night. The biggest danger on the road is other drivers. Tiny houses are like puppies. I always like to say, wherever we go we start conversations and spread smiles. Tiny house charm is contagious. It attracts people to you and your home, like bees to honey. We have often found yourself chatting with complete strangers at gas stations. We have even received impromptu invites to park on someone’s property or join them for dinner. Our advice: say yes, sometimes anyway. We have had the most remarkable conversations with people we would have never otherwise met if it wasn’t for their tiny house curiosity. Christian likes to say tiny houses are like puppies because people are drawn to them and can have little self-awareness about boundaries. Like the time I was making dinner, while parked at Walmart, and someone tried to open the door. Christian opened the door and found a fired-up tiny house enthusiast. She was a little lady, not trying to break in, just thought, ya know, we must be open for tours. “No; sorry. That’s why we do events. Please check out our website. Have a good night.” When something like this happens, typically we politely say no and then give the person a card. The excitement over tiny houses is we what like to call the “adorability factor.” This can be used as a foot in the door to more in-depth conversations with our neighbors and policymakers about the need for more housing options. A growing number of grassroots housing initiatives are using the tiny buzz to further their efforts to house and shelter those most in need. Tiny living makes some people squirm. We have had countless memorable, heartwarming and challenging conversations with strangers. Unfortunately, our choice to live tiny makes some feel guilty. Most people can agree that tiny living isn’t for everyone. I am perplexed by those who feel they must apologize to us for their large home and/or making excuses for why they can’t live tiny. We are happy to encourage others to reevaluate their housing needs, but please don’t feel that our choice is a comment on you, personally. 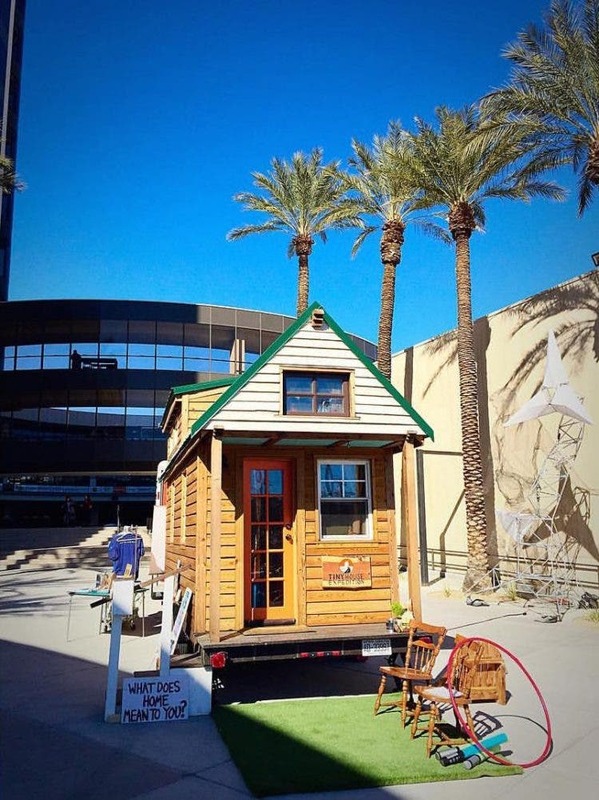 If a tiny home isn’t right for you, then it isn’t right for you. You can still enjoy them at festivals or via vacation rentals. It seems that untraditional housing is still quite edgy. It makes many uncomfortable and raises questions about property values, maintaining the status quo to poverty appropriation. 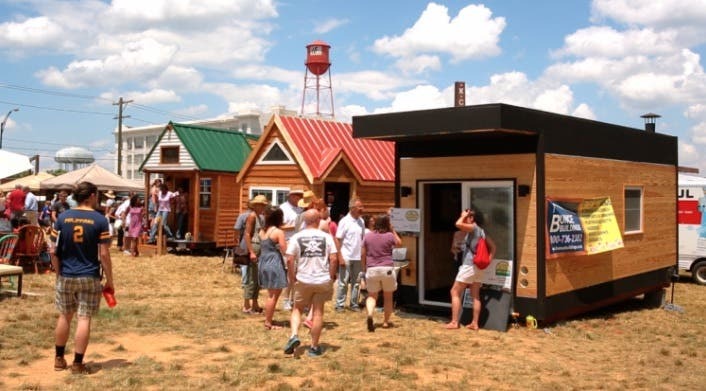 Tiny house exhibits are one of the most useful advocacy tools out there. No matter how open-minded a neighbor or a local official might seem, it can be mind-boggling for them to consider having a tiny house in their neighborhood. Even as popular as the tiny house shows are, most Americans have yet to experience one first-hand. The main reasons we invite strangers into our tiny home is to inspire change and foster acceptance. 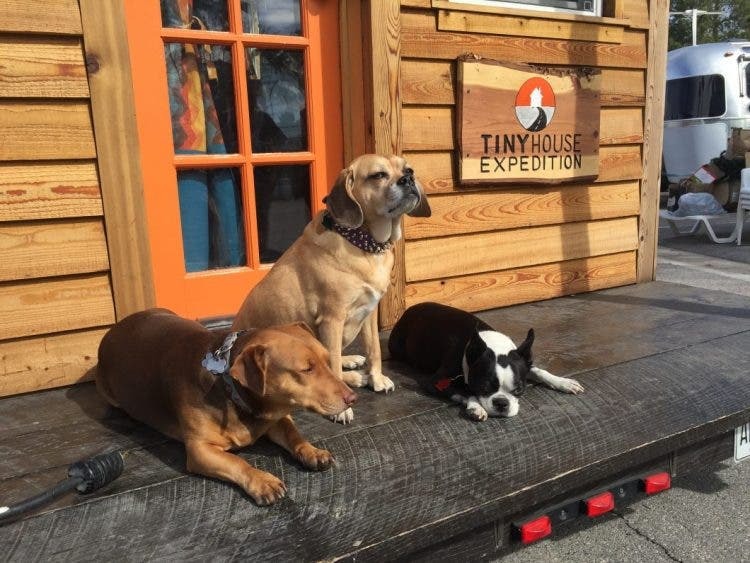 One of our favorite things about sharing our home with others is witnessing the mind-blowing, first-time reactions from ‘tiny house virgins.’ “Wow” gets uttered countless times throughout each open house we do. People often say, “it feels bigger than I thought it would.” We have found that there’s nothing like experiencing a tiny house in-person to appreciate the possibilities of small space design and to better understand how this could be a quality home for many, if not yourself. Back in 2016, we hosted a lively open house at Zappos headquarters in downtown Las Vegas for employees and locals. One of the most moving events that we have ever done. All because of one lovely lady, Mariana (not her real name). Her eyes were filled with wonder as she took in every aspect of our tiny house, very thoughtfully. After a thorough tour, Mariana turned to us, a little teary-eyed, and explained how our home was making her reevaluate what success meant to her. As a first-generation immigrant, Mariana had been working hard to achieve her material goals. Her whole life, she thought true success meant owning a large home. And now, Mariana realized that was not a valid metric. She said, “you have everything you need”; you are living comfortably and living well. What if success isn’t about how much you can buy? And isn’t about achieving a status symbol? Maybe just maybe, real wealth comes from the quality of your relationships and experiences. My heart swells remembering this conversation. There is nothing like witnessing a paradigm shift, up close and personal. This experience again proved to me that tiny house living is a force for positivity in the world. Christian and I have been together officially for five years. Together we have been traveling, living tiny and working on our documentary project for three years. We are almost always within arm’s reach or shouting distance apart. The physical time spent together far exceeds the typical couple that works apart from each other during the day. So, of course, we argue, a lot. Happy to report that our communication and problem-solving skills have significantly improved. With all that said, in work/live time, we’ve been together for more like ten years. The best way to test your relationship is to go on an extended road trip—a make it or break it experiment. A car camping road trip to Lake Michigan is what started us down our current path. Tiny house living is your ticket to everyday adventure. No matter if you travel or stay put, tiny living encourages a stronger connection to your surroundings, which opens the door to more experiences. Right now, I’m writing this article while sitting at the table in our tiny house, surrounded by windows with a view of the trees around us. I feel more connected to the outdoors, all because of the simple lack of extra space in our house. I love how this improves my mood and often draws me out for a walk—pretty much anywhere we are parked. Many of our all-time favorite parking spots have been back or side-yards. These places provide an opportunity for community, whether informal or formal, like Going Places in Portland. The close proximity of a backyard neighbor lends itself to relationship building and resource sharing. It’s so refreshing to have spontaneous conversations and extra helping hands around when needed. You don’t have to be best friends with your immediate neighbor(s), but you can form a cooperative partnership where you have each other’s back when the going gets rough. Traveling with a tiny house is doable. To date, we have racked up 54,000 miles with our tiny house. We have taken our tiny house to the desert, to the coast and up to 10,152 feet above sea level. It hasn’t always been an easy experience. The most important lessons learned are what not to do, like never travel without two spare tires and wheels. 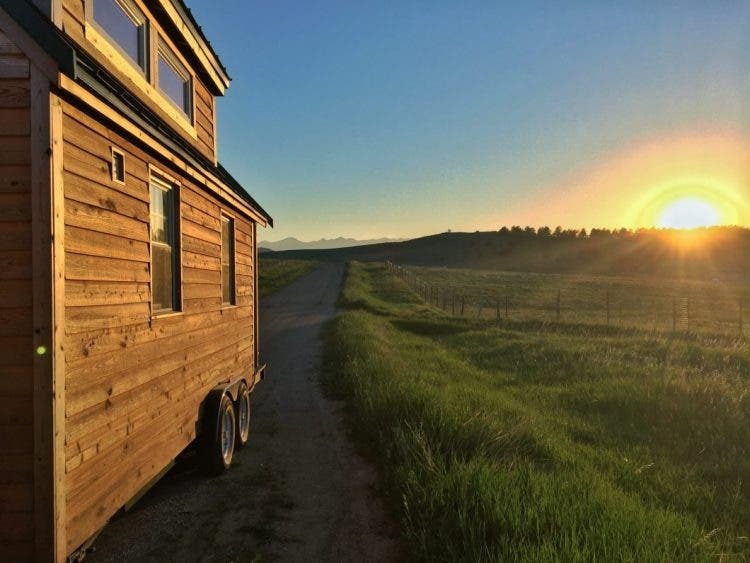 After all the ups and downs, our empowering takeaway is that do-it-yourself tiny house travel can be done, safely and enjoyably. If you are thinking of trying it out, we encourage to watch our how-to videos, and be sure to check our past Tiny House Travel 101 post. We’re here to help you! 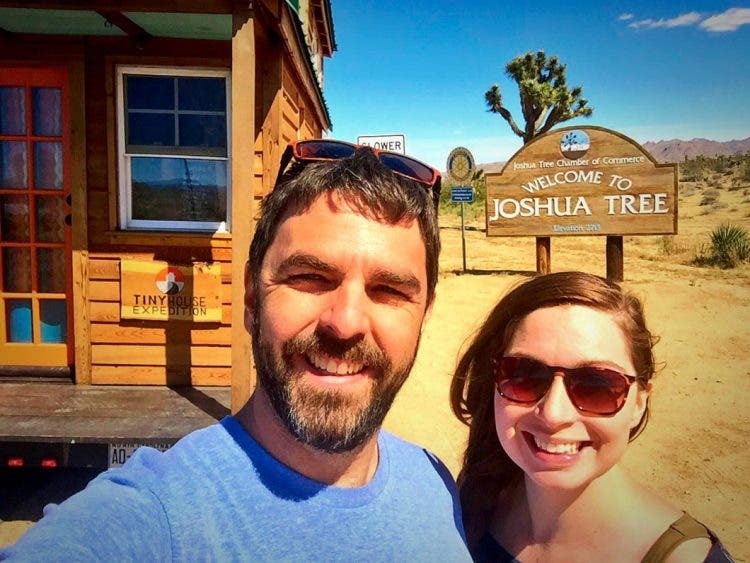 For an intimate look into our traveling tiny house life, watch our new travel vlog series. My partner, Christian and I are traveling tiny house dwellers. Together we’ve been on the road three and half years for our documentary and community education project, Tiny House Expedition. We live, breathe, dream the tiny home community every day. This is our life and our true passion project. We are very grateful to be able to experience this inspiring movement in such an intimate way and to be able to share our exploration with all of you.